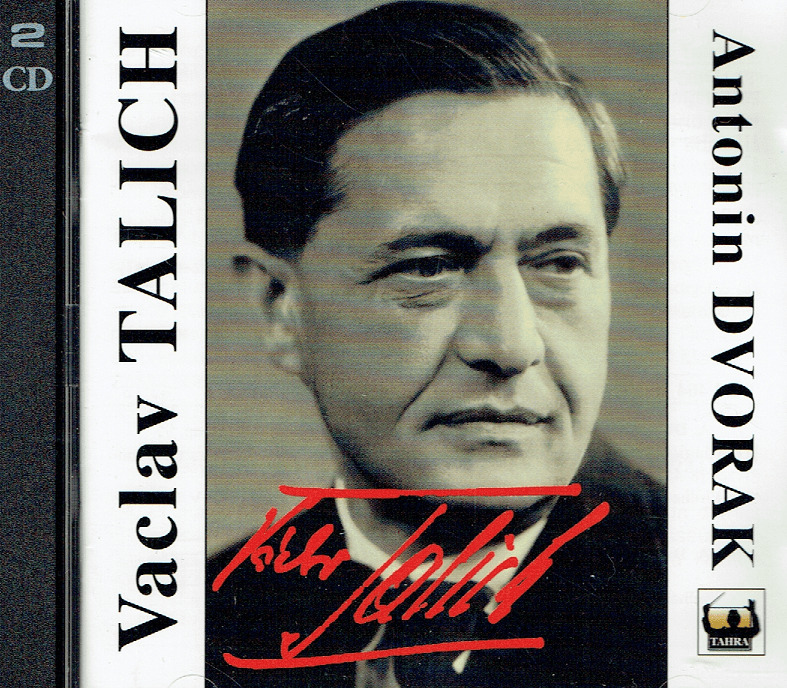 "Tahra’s last double album set devoted to Talich was exclusively of works by Dvorák. This latest release has one by him – the wartime Ninth Symphony - probably the least familiar of the three recordings Talich left. The conductor has also recently been celebrated in EMI’s ‘Great Conductors of the Century’ series and whilst superficially there might seem to be overlaps this is, with one exception, not the case. With the exception of the ‘New World’ all the recordings here chart Talich’s post-war time with the Slovak Philharmonic, most of which discs were concentrated in a burst of recording in 1950….The live recording in Prague is the more lithe and the better recorded; live in Prague in 1954 Talich was stimulated to greater reserves of energy and incision, especially so in the slow movement. 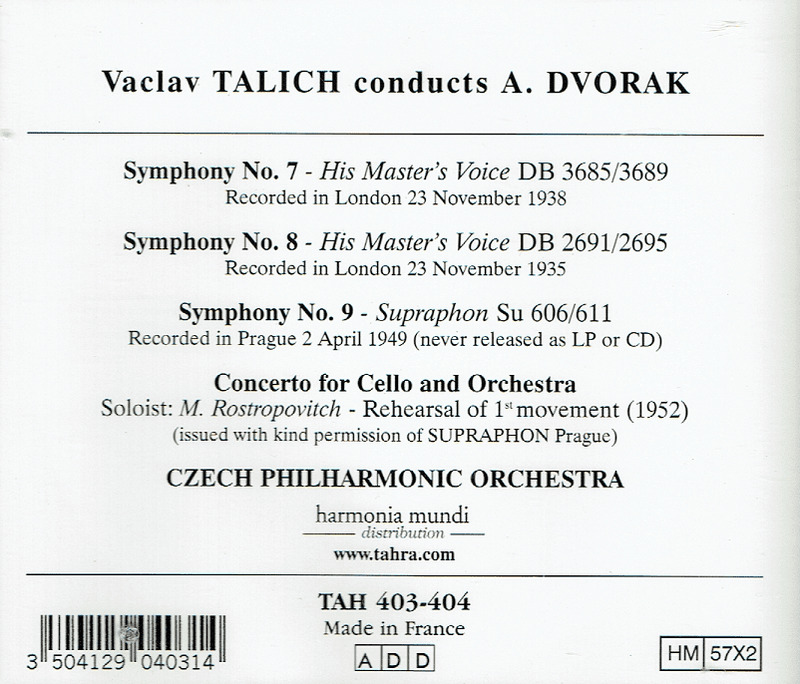 The ‘New World’ was one of a series of wartime discs Talich made with the Czech Philharmonic. Not surprisingly this 1941 recording of the ‘New World’ is tighter and tenser than Talich’s post-war 1950 and 1954 readings. It’s most marked in the slow movement where he is over two minutes faster in wartime than he was to be in his more mellow, relaxed and lyrical recordings. But one can hear even in the opening movement the sense of attacca tensile strength, powerful and strong, that courses through this reading. Demerits are the relative lack of inner part detailing in this recording. Strong positives are the Wagnerian glow of the slow movement and the skittering folk violins in the Scherzo, which is just a touch more expansive than the later recordings. Talich admirers will need to add this rare recording to their shelves. “Mstislav Rostropovich, the cellist and conductor who was renowned not only as one of the great instrumentalists of the 20th century but also as an outspoken champion of artistic freedom in the Soviet Union during the last decades of the cold war, played a vast repertory that included works written for him by some of the 20th century’s greatest composers. Among them were Shostakovich’s Cello Concertoi, Prokofiev’s Cello Concerto, Cello Sonata and Symphony-Concerto, and Britten’s Sonata, Cello Symphony and three Suites. Perhaps because his repertory was so broad, Mr. Rostropovich was able to make his cello sing in an extraordinary range of musical accents. In the big Romantic showpieces - the Dvorák, Schumann, Saint-Saëns and Elgar concerti, for example - he dazzled listeners with both his richly personalized interpretations and a majestic warmth of tone. His graceful accounts of the Bach Suites for Unaccompanied Cello illuminated the works’ structural logic as well as their inner spirituality. He could be a firebrand in contemporary works, and he seemed to enjoy producing the unusual timbres that modernist composers often demanded. He played the premieres of solo works by William Walton, Georges Auric, Dmitri Kabalevsky and Nikolai Miaskovsky, as well as concerti by Alfred Schnittke, Arvo Pärt, Krzysztof Penderecki and Lukas Foss, among others. As a conductor, he was an individualist. He happily molded tempi, phrase shapes and instrumental balances to suit an interpretive vision that was distinctly his own. And if his work did not suit all tastes, it was widely agreed that the passion he brought to the podium yielded performances that were often as compelling as they were unconventional. He was at his most eloquent, and also his most freewheeling, in Russian music, particularly in the symphonies of Tchaikovsky, Prokofiev and Shostakovich. He had a mischievous sense of humor that cut through the sobriety of the concert atmosphere. He sometimes surprised his accompanists by pasting centerfolds from men’s magazines into the pages of their scores. At the San Francisco Symphony’s 70th-birthday tribute to Isaac Stern, he played ‘the Swan’ movement from Saint- Saëns’ CARNIVAL OF THE ANIMALS attired in white tights, a ballet tutu, a swanlike headdress and red lipstick. In an interview in THE NEW YORK TIMES, Mr. Rostropovich said of Shostakovich, ‘He was the most important man in my life, after my father’. He added: ‘Sometimes when I’m conducting, I see his face coming to me. Sometimes it’s not really a happy face - I conduct maybe a bit too slow. So I conduct faster, and the face disappears’. He also studied composition with Shostakovich, and continued to do so even after the Soviet authorities condemned both Shostakovich and Prokofiev for ‘formalist perversions and antidemocratic tendencies’. He later studied composition privately with Prokofiev, and although Mr. Rostropovich’s compositions are not well known, they include two piano concerti, a string quartet and several solo piano works. Mr. Rostropovich, who was widely known by his diminutive, ‘Slava’ (which means ‘glory’ in Russian), was also an accomplished pianist. He was often the accompanist at recitals by his wife, the Russian soprano Galina Vishnevskaya, whom he married in 1955. Mr. Rostropovich became famous beyond musical circles as a symbol of artistic conscience and his defiance of the Soviet regime. When Mr. Solzhenitsyn came under attack by Soviet authorities in the late 1960s, Mr. Rostropovich and Ms. Vishnevskaya allowed him to stay in their dacha at Zhukovka, outside Moscow. He was their guest for four years, and Mr. Rostropovich tried to intercede on his behalf, personally taking the manuscript of ‘August 1914’ to the Ministry of Culture and arguing that there was nothing threatening to the Soviet system in it. His efforts were rebuffed. Mr. Rostropovich’s own troubles began in 1970 when, out of frustration with the suppression of writers, artists and musicians, he sent an open letter to Pravda, the state-run newspaper, which did not publish it. Western newspapers did. ‘Explain to me, please, why in our literature and art so often people absolutely incompetent in this field have the final word’, he asked in the letter. ‘Every man must have the right fearlessly to think independently and express his opinion about what he knows, what he has personally thought about and experienced, and not merely to express with slightly different variations the opinion which has been inculcated in him’. After the letter was published, Mr. Rostropovich and Ms. Vishnevskaya were unable to travel abroad and faced dwindling engagements at home. Occasionally, it would seem that the ban was lifted. In 1971, Mr. Rostropovich conducted and Ms. Vishnevskaya sang in Bolshoi Opera performances of Prokofiev’s WAR AND PEACE in Vienna, and Mr. Rostropovich was allowed to travel to the United States for concerts. But the next year, scheduled appearances in Austria and Britain were canceled without explanation. It was not until 1974 that they were allowed out of the country again. That year they were given two-year travel visas. In the West, Mr. Rostropovich told interviewers that he missed his homeland and longed to return but that he would not do so until artists were free to speak their minds. ‘I will not utter one single lie in order to return’, he said in 1977. ‘And once there, if I see new injustice, I will speak out four times more loudly than before’. The Soviet government’s response was to revoke his and Ms. Vishnevskaya’s citizenship in 1978. Thereafter they traveled on special Swiss documents. But they outlived the Soviet system. In November 1989, immediately after the fall of the Berlin Wall, he gave an impromptu concert there. Mr. Rostropovich’s Soviet citizenship was restored in January 1990. The next month, he took the National Symphony to Moscow and Leningrad (now St. Petersburg). The event was the subject of a television documentary, ‘Soldiers of Music: Rostropovich Returns to Russia’, released on video in 1992. In 1991, when Communist hard-liners tried to topple the more open regime, Mr. Rostropovich went to Moscow to stand beside President Yeltsin. Two years later, during the siege of the Russian White House, Mr. Rostropovich, who was touring Russia again with the National Symphony, gave a free concert in Red Square, attended by 100,000 people. Originally planned as a gesture to music lovers who were unable to attend the indoor concerts, the performance was transformed into a show of support for democratization. ‘Russians need to be reminded at times like this that they are a great people’, he told a TIMES reporter at the time. ‘Events disrupt things a little sometimes, but listening to this music is a reminder that there’s a great nation here’. Mr. Rostropovich made his conducting début in 1968, when he led a performance of Tchaikovsky’s EUGEN ONÉGIN at the Bolshoi. He made his British conducting début with the New Philharmonia Orchestra in 1974. His first American conducting performances were with the National Symphony and the San Francisco Opera in 1975. In 1977 Mr. Rostropovich accepted the directorship of the National Symphony Orchestra, succeeding Antal Doráti. He also brought the orchestra into the world spotlight, taking it on its first tours of Europe, Asia and the Soviet Union, conducting it regularly at Carnegie Hall, and making many recordings with it. In addition to conducting, he continued to pursue an active recital and concerto career as a cellist. His instrument was the 1711 ‘Duport’ Stradivarius, which he had fitted with a special bent tailpin, to make the angle at which he held the cello more comfortable.